Vegan dieting is far from boring when you have the right recipes in hand. Get creative when coming up with tacos to complete your menu as there a numerous vegan taco recipes to pick from. Each is unique and as delicious as it is nutritious. This colorful, mouth-watering recipe is sure to be a hit among vegan (and non-vegan) dieters alike. Saute the mushrooms in oil, soy sauce, mirin, and sesame seeds until brown. Bake (or heat up) the lentils according to package instructions. Place mushrooms, greens, lentils, onion, avocado, and salt to taste in the corn tortillas (divide ingredients evenly among the four tortillas). Drizzle with turmeric vegan sour cream (or vegan cashew sour cream) and enjoy! 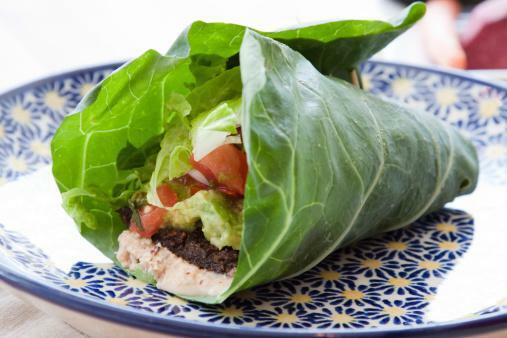 This flavorful meat- and dairy-free taco wrap recipe won't disappoint. Place 3 falafel patties (warm or cold, depending on your preference) in each tortilla -- toast the tortillas ahead of time, if desired. 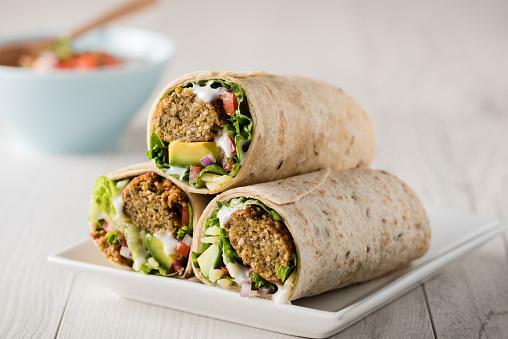 Drizzle with tahini sauce, wrap up, and enjoy! To change things up a bit and lower the amount of carbs you're getting from tortillas, choose lettuce wraps instead of traditional tortillas for your next vegan taco night. Combine rinsed lentils with broth in a pot and bring to a boil. Reduce heat and simmer for about 30 minutes; drain lentils and set aside. Combine flax seed with water and set aside. Sautee onions with oil and salt in a pan over medium heat until onions begin to brown. Add celery, carrots, and mushrooms to onions and saute another 10 minutes. Combine sauted vegetable mixture with lentils, flax mixture, and all other ingredients in a large bowl. Stir until evenly combined. Bake at 375 degrees for 40 to 45 minutes and let cool for 10 minutes. Prepare nut loaf as instructed, let cool, and slice. Place wrap ingredients (divided into four equal amounts) into each collard leaf. Wrap collard leaves around filling ingredients into a taco shape. Use hummus in place of almond cheese, if desired. 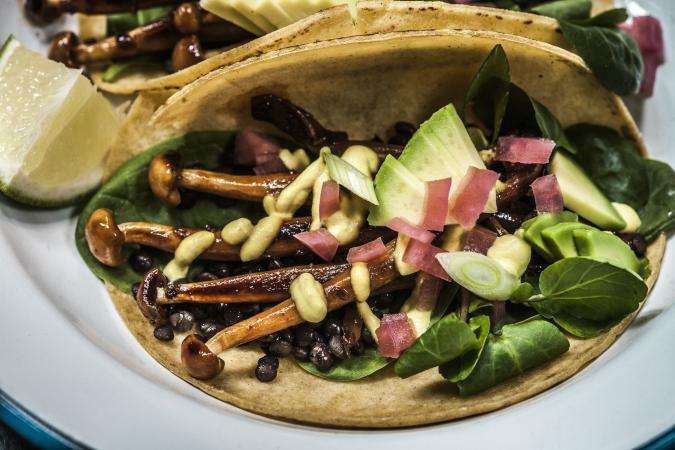 Making creative plant-based tacos is an excellent way to keep vegan diets interesting and incorporate veggies and protein into nutritious, well-balanced dishes.